Getting app analytics right is increasingly important for app owners and developers. Defining the strengths and setbacks of an app is invaluable for creating the best user experience. At the same time, measuring the impact of user acquisition is a must for determining which strategy works and which needs revisiting. Here is our review of the 5 most efficient app analytics and attribution services, which help app developers dive deeper into user behavior and discover its impact on the app success and profitability. Appsee is an analytics service for product managers, developers, marketers and UX designers. The features available with Appsee include real-time app analytics, conversion funnels, retention analytics and navigation paths. 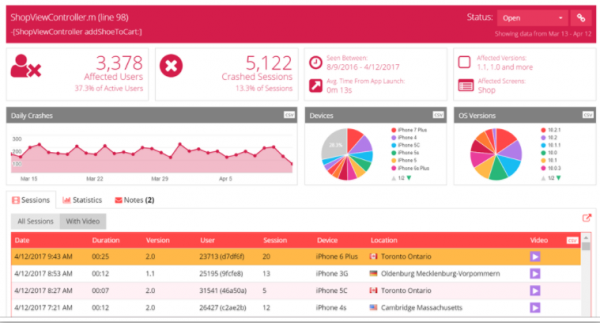 However, the most notable features are crash reporting and videos, which automatically record the user sessions and the events that led up to a crash. Thanks to these capabilities, there is no need for app developers to recreate the issues — the user sessions are recorded in the system. Another helpful feature is the touch heat map, a helpful visualization of the user interaction with an app. App developers can see the progress of user engagement with the app elements, all in a simple, intuitive interface, identifying weak points and eliminating unresponsive features. Overall, Appsee is a simple, yet sophisticated service for app developers and marketers. Pricing: Free/Premium/Enterprise plans; 14-day free trial. Appsflyer is an app analytics and attribution services that allows analyzing user acquisition and correctly attributing marketing channels, down to every campaign. 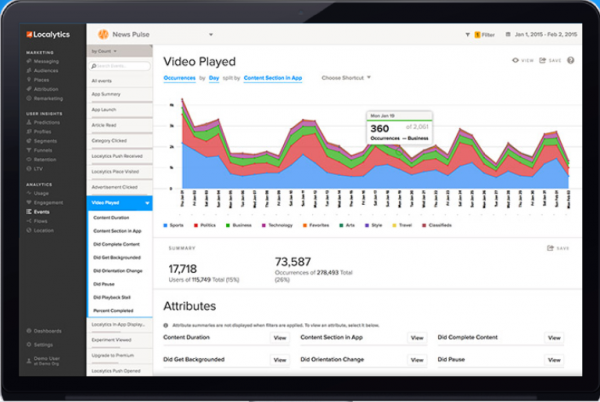 The service also offers marketing analytics for a deep dive into in-app user behavior. To add to that, Appsflyer is known for its fraud protection services. Having integrated with Appsflyer via SDK, app developers access aggregated data on impressions and click reports gathered from ad networks and media sources in a single dashboard. Moreover, there are LTV and ROI reporting, ad revenue attribution and uninstall attribution to help app owners get the full picture of the app performance. For brands that have digital and offline assets in addition to the app, Appsflyer offers omnichannel measurement and analytics, to complement mobile attribution with marketing, sales, and operational data from across other channels and create a seamless experience for the user. Pricing: Basic/ Premium package; 30-day free trial. Starting with $0.03 cost per conversion. Localytics is a powerful analytics tool for mobile and web devices. The service offers a range of services for app developers, for marketing attribution and tracking user interaction with the app. One of the peculiar features, offered by Localytics, is predicting the app users’ actions and determining when they are going to churn or convert. With that information in hand, marketers can differentiate user segments and send personalized campaigns, specifically designed either to re-engage or lead the users up to convert. With Localytics, marketers can send push notifications and benefit from what Localytics calls “nurturing users inside an app”, which includes customized alerts inside an app, optimized to appear when users complete certain actions. 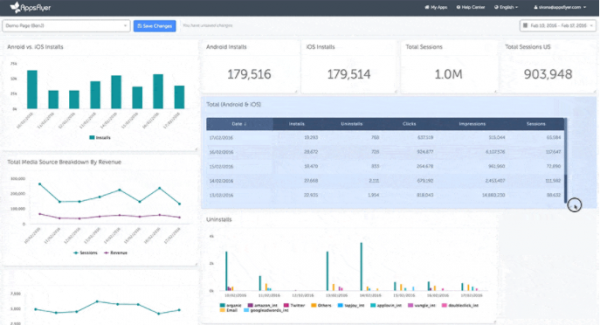 It is also worth noting that Localytics offers mobile CRM, as well as connection to marketing cloud services, such as Salesforce and Oracle. 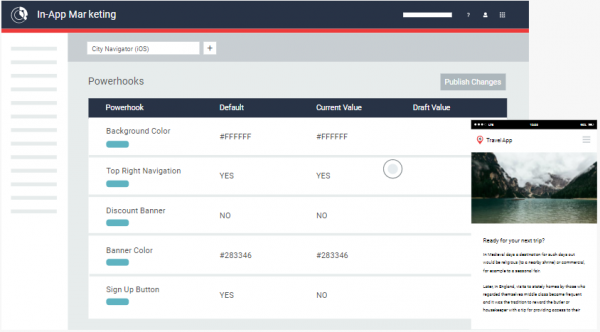 Mixpanel is a service that covers mobile, as well as web and other software platforms. It’s product-focused and promises valuable insights on how users interact with the app. Mixpanel offers features that range from engagement, funnels, and JQL analytics, to Autotrack for the web. As for mobile, Mixpanel is particularly strong in tracking user engagement and determining which app features drive conversions and which need revision — the data invaluable for decreasing churn rate and identifying problematic issues in an app. Mixpanel is also an attribution analytics service, which helps to find out which media sources are the most efficient for driving mobile installs. 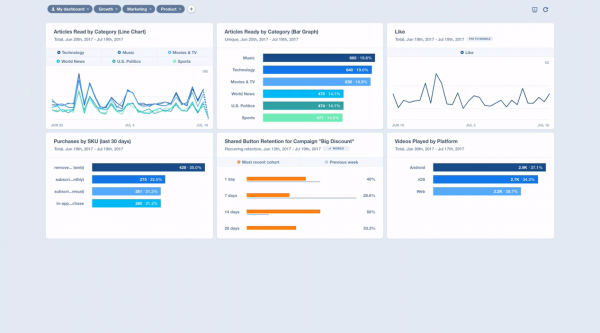 Tune is a mobile analytics and performance marketing platform, which offers a range of services and solutions: Marketing Console, App Store Analytics, Attribution Analytics, Fraud Prevention and HasOffers software. The service handles traffic attribution as well as in-app user behavior analytics, to streamline the app development and marketing process. With the automated trigger and scheduled campaigns, marketers receive tools for nurturing users and driving conversions. And for reaching out to users even more efficiently, there is the personalized messaging tool. For app owners and marketers, the app analytics service provides an “Update with one click” feature, which allows making changes in the app without developer or engineer, or the necessity to re-submit it into the app store. Choosing the right app analytics service is essential for app owners and marketers. However, the selection is highly dependable on the current needs of the app. Whether the focus should be on attribution or in-app behavior, access to raw data and real-time updates or strong visualization, is up to the app owners. Eventually, qualitative analysis of data and profound knowledge of the audience is no less important than in-depth analytical reports.